Escape from South Beach: 55,000 Giants Fans vs. Todd X. 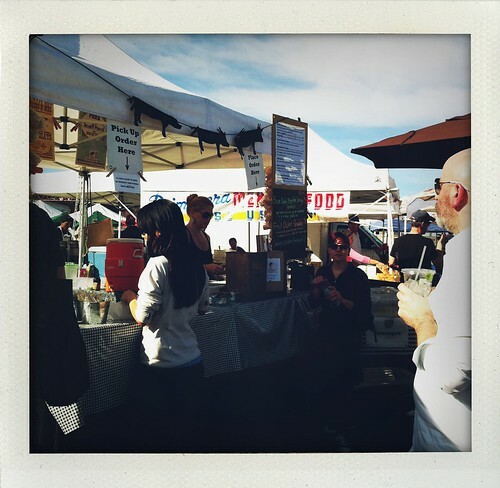 This past Saturday was a beautiful day in San Francisco. Sunshine and warmth in February. Perfect. 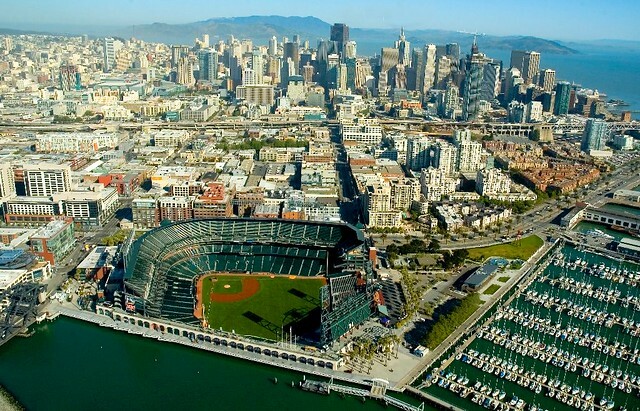 Unfortunately, I was going to have to share my neighborhood with over 50,000 Giants fans. FanFest was upon us. I'm a caffeinated force of nature, but even I have to relent when faced with that many sports fans. So, I did what Napoleon should have done and got out of Dodge (ah, mixed historical metaphors). 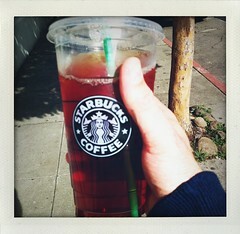 My trip began as any walkabout should--with iced tea. I adore my local Starbucks team. They make a mean glass of iced tea AND have my tea ready for me by the time I reach the cash register. Amazing. Now that's worth a tip. So, with tea in hand, I began my walk. I couldn't resist walking by AT&T Park to see some of the mayhem. I was not disappointed. Behold the fans, waiting to get inside the stadium. It was scary. 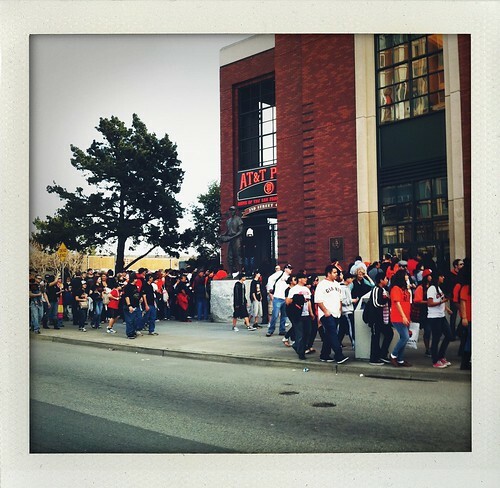 Apparently, AT&T Park management had kept people out and were slowly letting fans in as people left, but they had also told people to stay away if they weren't already in South Beach. 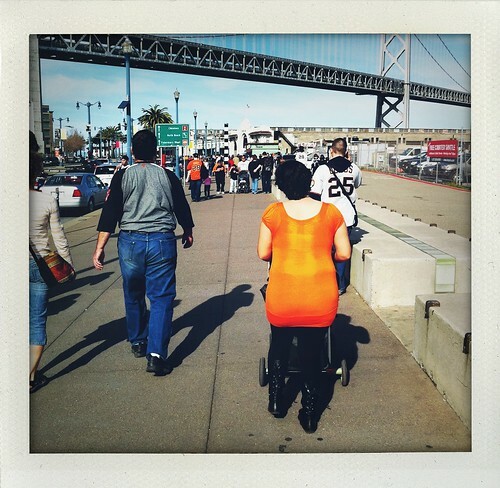 Too many Giants fans! But, did I mention it was sunny? So I walked down to the marina. Boats! 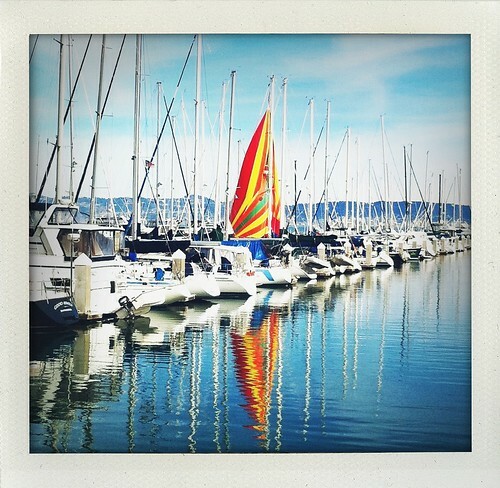 I don't know how to sail, but I'm pretty sure that I could sneak onto one of these boats without anyone noticing. Look out Hawaii! I'm coming!! Back to the walk. 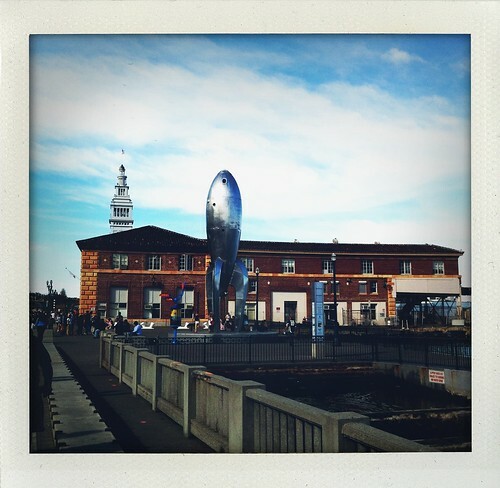 I took the Embarcadero with the intention of getting lunch at the Ferry Building. It's always nice to walk along the water and take in the sights of San Francisco. And to escape the FANS!! So I walked faster. I'll be safe when I reach the rocket. I'll be safe when I reach the rocket. Oh, there it is. Whew. I had a hankering for a 4505 Meats cheeseburger. These little burgers are salty and delicious. But. . .
4505 was out of burgers. Nooooooo!! I ordered a chicken sandwich instead. It was a mistake I won't make again. The sandwich sounded so good, but the execution was truly unappetizing. It was as though they had take some chicken, wrapped it in chicken fat and skin, battered it, and deep fried it, then placed it on a bun. The result was, for me, nearly inedible. You should have seen the little boy sitting next to me watch me as I picked it apart, trying to get at some random piece of edible chicken. Poor thing. I probably gave him an eating disorder. Alas, I don't have photos of the carnage. I tossed the remains of the chicken sandwich carcass into the compost bin and headed back to the Embarcadero. I walked down one of the pedestrian piers to take in the view and snap some photos. Why don't I do this more often? Enough of this seaside joy! Into the heart of the city! So I set off toward North Beach, walking down Broadway toward City Lights Books. 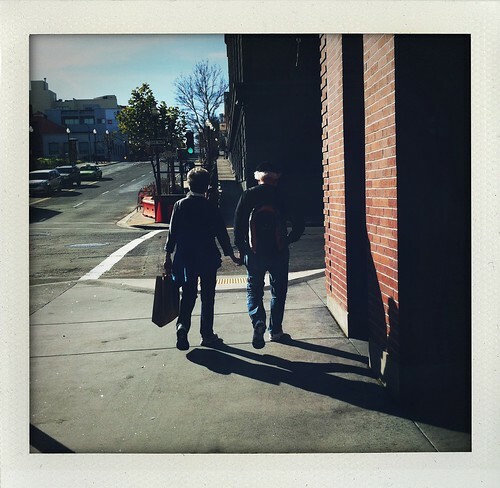 Along the way, I saw this cute couple, holding hands as they walked along the street. There should be a law against such PDA. Save it for the Castro folks!! With some fancy footwork and a swift kick to the man's weaker knee, I passed the couple and made my way to City Lights. It's always nice to wander around, check out the books, and read the staff recommendations. I didn't buy anything because I was afraid the BF would have a fit (yes, I have a book problem). Still, it's nice to visit. Leaving the bookstore, I decided to turn toward Chinatown. If your city doesn't have a Chinatown, you're missing out. And this just happened to be the day after Chinese New Year! Shout out to the Rabbit! Don't get me wrong. 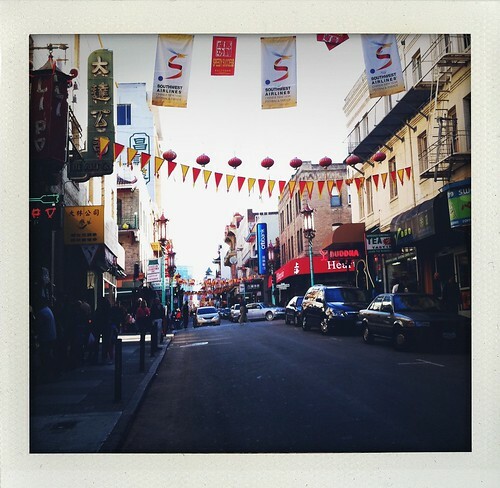 People in Chinatown are crazy--mostly the tourists, but it's a sight not to be missed. I made my way to Union Square, stopped off at Borders (please note the earlier admission of Bookaholism), and then went to the Gap. It's the law in SF. Finally, I needed to head home. 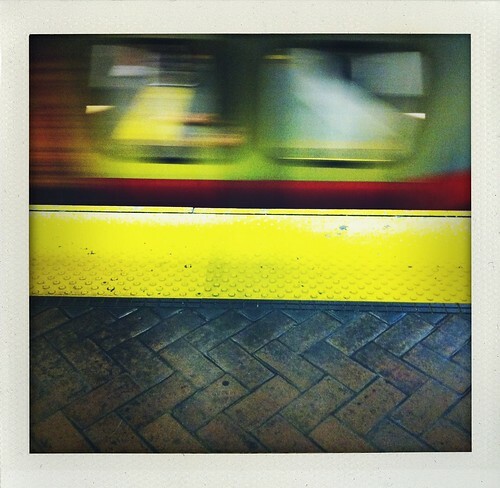 MUNI seemed to be the quickest way to get home. 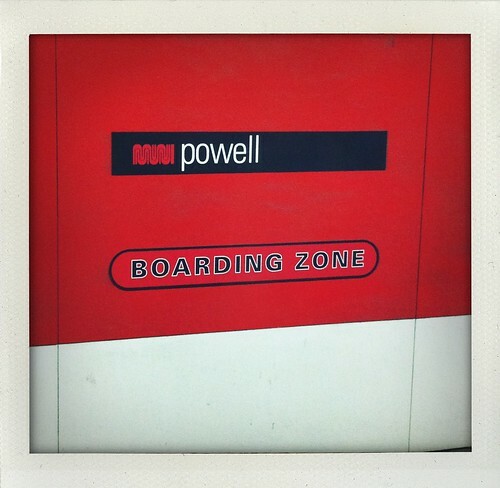 I walked down to Powell Station and waited. You see, that's what one does in San Francisco: wait. And wait. And wait. Okay, it wasn't that bad. After about six minutes, my train arrived and I headed back to a FanFest-free South Beach.